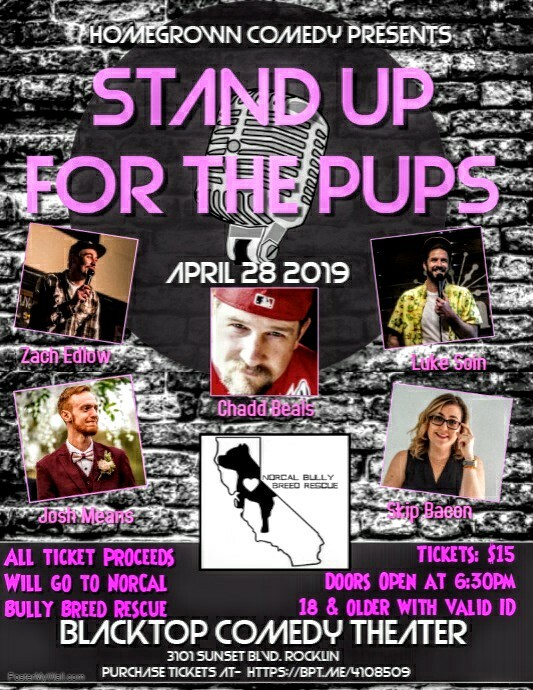 Homegrown Comedy Presents Stand Up For The Pups. A night of stand-up from comedians: Chadd Beals, Zach Edlow, Josh Means, Skip Bacon, and Luke Soin. All ticket proceeds go to NorCal Bully Breed Rescue a non-profit organization, benefiting dogs rescued from shelters with an emphasis on major medical rescues. These pups are fostered by an amazing team of local NorCal Bully Breed Rescue volunteers. Funds will help cover costs for dogs with severe medical conditions & the costs for their day to day care. We will also be hosting a 50/50 raffle, so bring your dollar bills in efforts to help in making a better life for these fur babies.